These are rather complex questions. It has been legal to import absinthe into the United States since 2007, but it was banned for almost 100 years before that. The U.S. was not the only country to ban absinthe. Around 1914, it was pretty much banned everywhere except Eastern Europe and (for some reason) Australia. How similar it is to the absinthe Poe and Rimbaud drank 150 years ago is up for debate. The controversial element is thujone, a chemical in wormwood oil, which is one of the primary ingredients in absinthe production. Some say it makes you crazy. Others say it makes you hallucinate. Most of these claims are thought to be highly exaggerated, but modern absinthes do have a lower thujone level than the ones in the 19th century did. Our opinion is that the only thing that will make you crazy is the price. You can’t buy any decent absinthe for less than $60, which puts it on par with single malt scotches, pricewise. Absinthe is a high-proof liquor, but unlike whiskey, it isn’t intended to be consumed straight. The traditional method of serving is to add sugar and ice cold water. Some people like to use a sugar cube soaked in absinthe and set it on fire, which makes for a great show, but it does nothing really for the flavor in the end. Water is added until the absinthe “louches” or changes from translucent to a milky color. One of the major flavor components of absinthe is anise, which doesn’t appeal to everyone. Some have more or less of this flavor and some have a more complex flavor that balances nicely with the anise. Lucid – Made in France, this was the first absinthe that the U.S. allowed to be imported after the ban. Therefore, it is still the most commonly found. It retails in Alabama for $59.99 and weighs in at 124 proof. It louches to a greenish white color. The flavor is mild and not especially complex. We recommend keeping it in stock for sazeracs and other cocktails that use a small amount of absinthe, mainly because of it’s one of the less expensive brands. Pernod – Pernod is another French brand and one of the oldest brands around. In fact, they claim to be the inventors of it, although there are others who make the same claim. Pernod remained in the market after the ban by making an anise liqueur that could be used as a substitute for absinthe in cocktails. The absinthe they make now is supposedly identical to the way they made it back in 1805. It louches to a yellowish green. Pernod absinthe is 136 proof and will cost you about $70 a bottle. It’s one of our favorites, but unfortunately, you can’t buy it in Alabama. La Fee – Also made in France, La Fee is distinguished by it’s neon green color, which turns to a whiter shade of green when louched. It has a strong anise flavor, but is not particularly complex beyond that. It retails for about $60. It’s 136 proof, so a better deal than Lucid at the same price, but alas, you can’t get it in Alabama. Kübler – Kübler is a Swiss absinthe, which has a little different character than French absinthe. 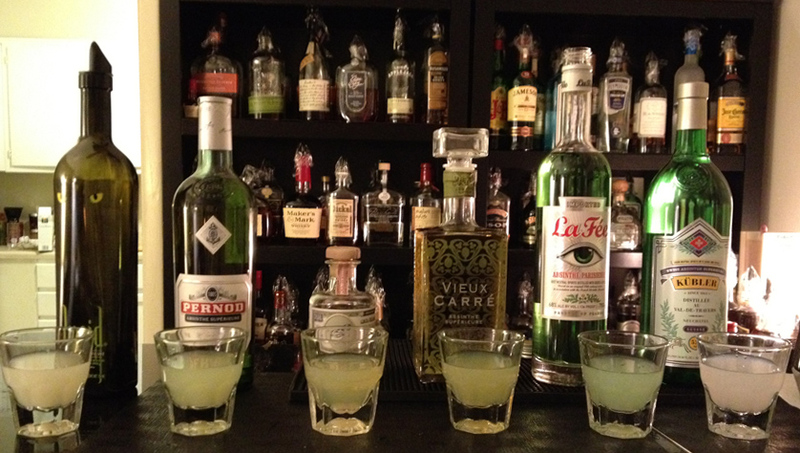 Swiss absinthe is more tends to be more white than green and not as heavy on anise. This absinthe becomes milk white when louched. It’s a relatively light 106 proof and retails for $66 in Alabama (you can get it cheaper elsewhere, though). St. George – In our opinion, this is the best American absinthe on the market. It has a yellow color and a mild but complex flavor. Its proof is middle of the road at 120. Sadly, you can’t get it in Alabama. If you are travelling to Atlanta or Nashville, you may find it anywhere from $60 to $80. Vieux Carré – This American absinthe has such a unique, earthy, and grassy character that we have trouble calling it absinthe at all. It doesn’t much appeal to us, but if you don’t like more traditional absinthes, you might give this a try. Like St. George, it’s 120 proof. You can’t get it in Alabama, but you can find it elsewhere for about $60. This entry was posted in tastings and tagged absinthe.